A duck-like-diver that are at first glance similar to a loon, Red-necked Grebes, like all grebes, are smaller, have flat, lobed toes, and appear tailless. A migratory aquatic bird, they are great swimmers, nimble divers and respond to threats of danger by diving instead of flying. 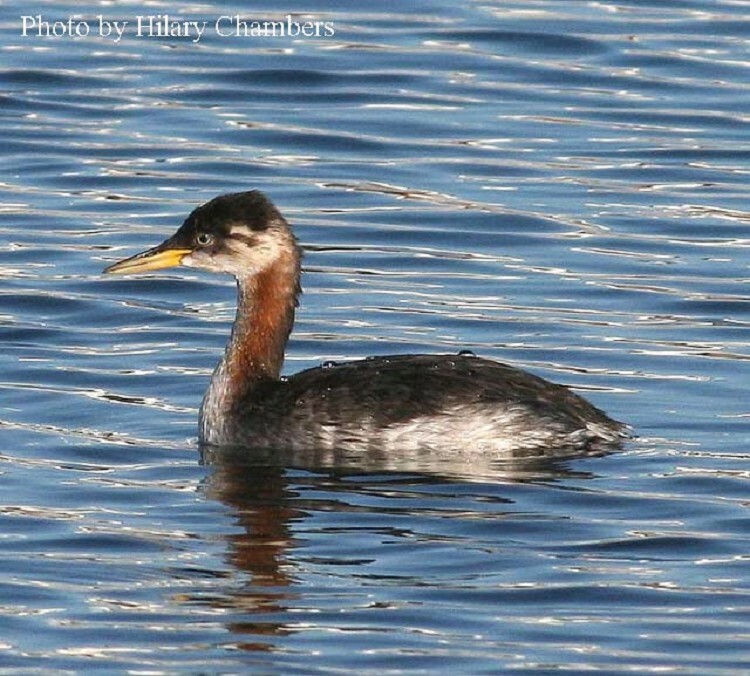 This grebe is a rare, but welcome winter visitor to the open lakes of Tennessee. Description: The Red-necked Grebe is a fairly large and stocky with a broad triangular head and thick neck. The reddish neck and breast contrasting with the white cheeks, black cap and dark body is quite stunning when compared to the winter plumage that appears somewhat dingy with a brown body, blackish cap and pale-gray crescent patch extending from the chin to behind the ear. The long, heavy bill is yellow and angles downward in all plumages. Red-necked grebe fly in straight line formations with rapid, direct strong wing beats and are the only grebe to show a white leading edge and white trailing edge on their inner wings when in flight. Voice: Loud braying, chattering call with quivering endnote. Western Grebe – Similar in size, longneck always white, red eye and long slender greenish bill. Extremely rare in Tennessee. Clarks Grebe – Larger in size, white face above and below the eye, red eye, long slender yellow bill. Extremely rare in Tennessee. Red-breasted Merganser – Rusty brown, wispy crest, reddish thin bill. 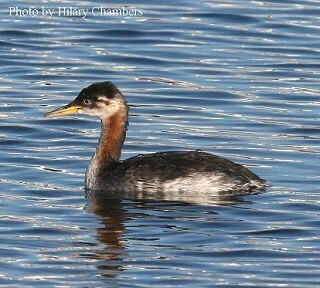 Habitat: In Tennessee, Red-necked Grebes can occasionally be found on large, open freshwater lakes. Diet: Small fish, crustaceans, and aquatic insects. Dives 25-30 feet to find food. Nesting and reproduction: There are no known records of this species nesting in Tennessee. Status in Tennessee: The Red-necked Grebe is an uncommon migrant in early spring and late fall, occasionally found in winter in Tennessee. There was a major irruption into eastern Tennessee in March 2014 with over 100 being found in upper east TN with singles found as far west as Cordell Hull Dam, Lake Karen in McMinnville, and Fall Creek Falls SP. Walking on land is difficult for Grebes. Grebes eat their own feathers and feed them to their young.